The famed foul "Gum Wall" at Seattle's Pike Place Market is getting cleaned up after 20 years of ad hoc additions from passers-by looking to add a wad to the colorful piece of "public art." I'm not typically squeamish, but a shrine to people's used sugar balls and saliva seems pretty gross. But there's no arguing that the spot has become an iconic must-stop for folks visiting the market from near and far. The people at Pike Place estimate that more than one million pieces of gum are now attached to the wall that stretches eight feet high, and 54 feet wide. 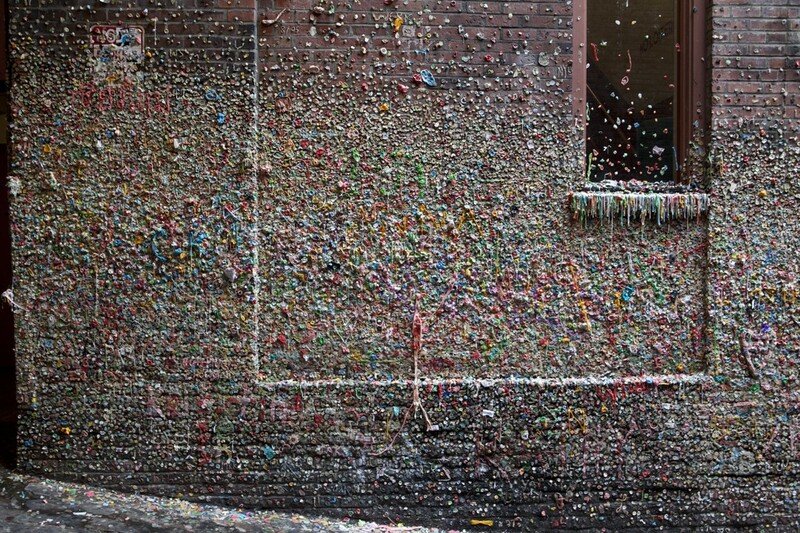 That equates to about 150 pieces of gum per brick, according to a report from King5 News. The Gum Wall began about 20 years ago, and has been going strong ever since. The cleanup is necessary, according to the Pike Place Market, because the sugar in the gum is eroding the brick that houses the Market Theater. Once the cleanup is done, though, visitors will once again be able to dot the wall with Bubblicious, Hubba Bubba and Wrigley's to their hearts' content.